For the Ted Nugent album, see Cat Scratch Fever. For the Nickelodeon cartoon, see Catscratch. Cat-scratch disease commonly presents as tender, swollen lymph nodes near the site of the inoculating bite or scratch or on the neck, and is usually limited to one side. This condition is referred to as regional lymphadenopathy and occurs 1–3 weeks after inoculation. Lymphadenopathy in CSD most commonly occurs in the arms, neck, or jaw, but may also occur near the groin or around the ear. A vesicle or an erythematous papule may form at the site of initial infection. Most patients also develop systemic symptoms such as malaise, decreased appetite, and aches. 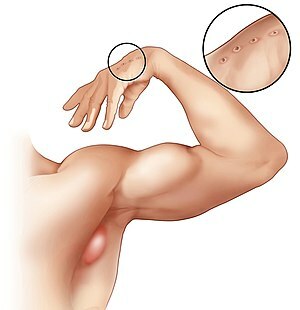 Other associated complaints include headache, chills, muscular pains, joint pains, arthritis, backache, and abdominal pain. It may take 7 to 14 days, or as long as two months, for symptoms to appear. Most cases are benign and self-limiting, but lymphadenopathy may persist for several months after other symptoms disappear. The disease usually resolves spontaneously, with or without treatment, in one month. 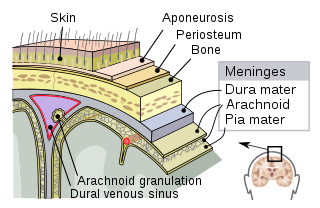 A papule is a circumscribed, solid elevation of skin with no visible fluid, varying in area from a pinhead to 1 cm. It can be brown, purple, pink or red in color, and can cluster into a papular rash. Papules may open when scratched and become infected and crusty. Larger non-blisterform elevated lesions may be termed nodules. Encephalopathy means any disorder or disease of the brain, especially chronic degenerative conditions. In modern usage, encephalopathy does not refer to a single disease, but rather to a syndrome of overall brain dysfunction; this syndrome can have many different organic and inorganic causes. Bartonella henselae is a fastidious,  intracellular, Gram-negative bacterium. Micrograph of a lymph node affected by cat scratch disease. H&E stain. 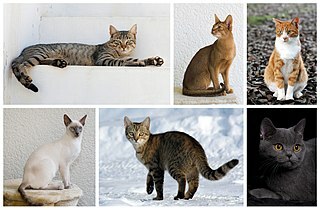 Cat bites are bites inflicted upon humans, other cats, and other animals by the domestic cat. Though uncommon, sometimes cat bites can lead to complications and, very rarely, death. 1 2 3 4 5 6 7 8 9 "Cat scratch disease". GARD. Retrieved 2018-04-17. 1 2 3 4 5 6 7 8 9 10 11 12 13 14 "Bartonellosis". NORD. 2017. Retrieved 30 September 2018. 1 2 3 4 5 6 7 8 9 10 Klotz SA, Ianas V, Elliott SP (2011). "Cat-scratch Disease". American Family Physician. 83 (2): 152–5. PMID 21243990. 1 2 3 4 5 6 7 8 9 10 11 Florin TA, Zaoutis TE, Zaoutis LB (2008). "Beyond cat scratch disease: widening spectrum of Bartonella henselae infection". Pediatrics. 121 (5): e1413–25. doi:10.1542/peds.2007-1897. PMID 18443019. ↑ Gajula V, Kamepalli R, Kalavakunta JK (2014). "A star in the eye: cat scratch neuroretinitis". Clinical Case Reports. 2 (1): 17. doi:10.1002/ccr3.43. PMC 4184768 . PMID 25356231. ↑ Perkocha LA, Geaghan SM, Yen TS, Nishimura SL, Chan SP, Garcia-Kennedy R, Honda G, Stoloff AC, Klein HZ, Goldman RL (1990). 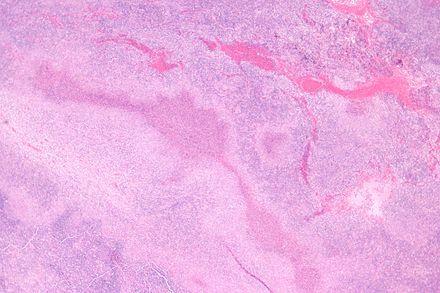 "Clinical and pathological features of bacillary peliosis hepatis in association with human immunodeficiency virus infection". The New England Journal of Medicine. 323 (23): 1581–6. doi:10.1056/NEJM199012063232302. PMID 2233946. ↑ Higgins JA, Radulovic S, Jaworski DC, Azad AF (1996). "Acquisition of the cat scratch disease agent Bartonella henselae by cat fleas (Siphonaptera:Pulicidae)". Journal of Medical Entomology. 33 (3): 490–5. doi:10.1093/jmedent/33.3.490. PMID 8667399. ↑ Foil L, Andress E, Freeland RL, Roy AF, Rutledge R, Triche PC, O'Reilly KL (1998). "Experimental infection of domestic cats with Bartonella henselae by inoculation of Ctenocephalides felis (Siphonaptera: Pulicidae) feces". Journal of Medical Entomology. 35 (5): 625–8. doi:10.1093/jmedent/35.5.625. PMID 9775583. ↑ Copeland, Claudia S. (2015). "Cat Scratch Fever? Really? : Cats, Fleas and the Many Faces of Bartonellosis". Healthcare Journal of Baton Rouge: 28–34. Archived from the original on 2015-11-22. ↑ Mascarelli PE, Maggi RG, Hopkins S, Mozayeni BR, Trull CL, Bradley JM, Hegarty BC, Breitschwerdt EB (2013). "Bartonella henselae infection in a family experiencing neurological and neurocognitive abnormalities after woodlouse hunter spider bites". Parasites & Vectors. 6: 98. doi:10.1186/1756-3305-6-98. PMC 3639822 . PMID 23587343. ↑ Lantos PM, Maggi RG, Ferguson B, Varkey J, Park LP, Breitschwerdt EB, Woods CW (2014). "Detection of Bartonella species in the blood of veterinarians and veterinary technicians: a newly recognized occupational hazard?". Vector Borne and Zoonotic Diseases. 14 (8): 563–70. doi:10.1089/vbz.2013.1512. PMC 4117269 . PMID 25072986. ↑ Rosado FG, Stratton CW, Mosse CA (2011). "Clinicopathologic correlation of epidemiologic and histopathologic features of pediatric bacterial lymphadenitis". Archives of Pathology & Laboratory Medicine. 135 (11): 1490–3. doi:10.5858/arpa.2010-0581-OA. PMID 22032579. ↑ Nelson, Christina A.; Saha, Shubhayu; Mead, Paul S. "Cat-Scratch Disease in the United States, 2005–2013". Emerging Infectious Diseases. 22 (10): 1741–1746. doi:10.3201/eid2210.160115. PMC 5038427 . PMID 27648778. ↑ Carithers, H. A. (1985-11-01). 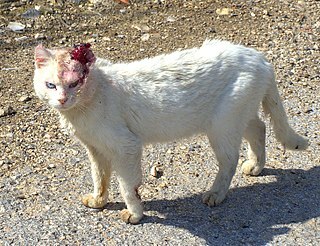 "Cat-scratch disease. An overview based on a study of 1,200 patients". American Journal of Diseases of Children. 139 (11): 1124–1133. doi:10.1001/archpedi.1985.02140130062031. ISSN 0002-922X. PMID 4061408. ↑ Rolain, J. M.; Brouqui, P.; Koehler, J. E.; Maguina, C.; Dolan, M. J.; Raoult, D. (2004-06-01). "Recommendations for Treatment of Human Infections Caused by Bartonella Species". Antimicrobial Agents and Chemotherapy. 48 (6): 1921–1933. doi:10.1128/AAC.48.6.1921-1933.2004. ISSN 0066-4804. PMC 415619 . PMID 15155180. 1 2 3 Chomel, Bruno B.; Boulouis, Henri J.; Breitschwerdt, Edward B. (April 15, 2004). "Cat scratch disease and other zoonotic Bartonella infections" (PDF). Vet Med Today: Zoonosis Update. 224: 1270–1279 – via JAVMA. 1 2 3 4 5 Windsor, Jeffrey J. (2001). "Cat-scratch Disease: Epidemiology, Etiology, and Treatment" (PDF). British Journal of Biomedical Science. 58: 101–110. ↑ "Profile of Pet Owners". Pew Research Center. November 4, 2010. Retrieved November 29, 2017. ↑ Asano S (2012). 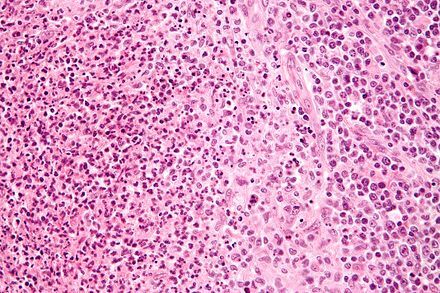 "Granulomatous lymphadenitis". Journal of Clinical and Experimental Hematopathology. 52 (1): 1–16. doi:10.3960/jslrt.52.1. PMID 22706525.